Sounded yum. It uses the usual Dan Lepard low knead technique that I’m a big fan of and have written about here. It was pretty easy to make and came out with a lovely soft crumb. It made fantastic cheese sandwiches and wonderful toast. I haven’t found the recipe online anywhere so just some pictures this time. 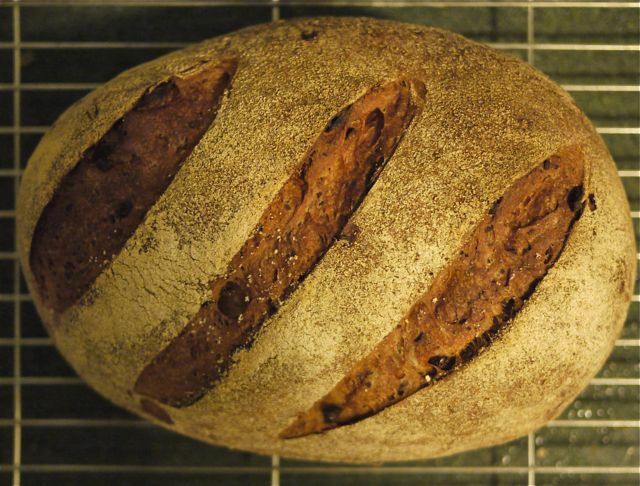 Looks yummy – I’m planning which loaf to try from the River Cottage book. Do you have a favourite? .-= Christine´s last blog ..week 31 corsage =-. Visiting the out laws in Finland often means we are served coffee and pulla, a sweet butter and egg rich bread thats almost cake ! This bread sounds delicious. I’m currently baking through the River Cottage bread book. I also have this Dan Lepard book which I’m ashamed to say I have not baked from yet (and have had the book 18 months or so!). Will have to try this recipe some time, maybe I’ll bake my way through this book after RC. .-= Claire´s last blog ..Adventures in soda bread =-. I really enjoy breads with a bit of nuts in them. This sounds really lovely. I do love Lepard’s method and found that his whole wheat loaf (as published by the Guardian recently) works really well for me. I’m interested to see what you bake next. .-= sarah, simply cooked´s last blog ..magic beans =-. I’ve made this recipe again twice more with great results. The 2nd time I shared the bread with friends at a picnic lunch at a food event and they all loved it, so its not just me who is a fan. Dave: Pulla sounds great I love soft breads, might give it a try as one of my experiments. Claire: I have done lots more from Dan Lepard that River Cottage but I decided to do both in tandem for variety. Its a great way to try new things. Must blog the rest of the experiments so far ! Sarah: I love the Dan Lepard method. I’m still doing his quick loaf on different variations as a basic recipe each week and then the experiments are extras must blog them. 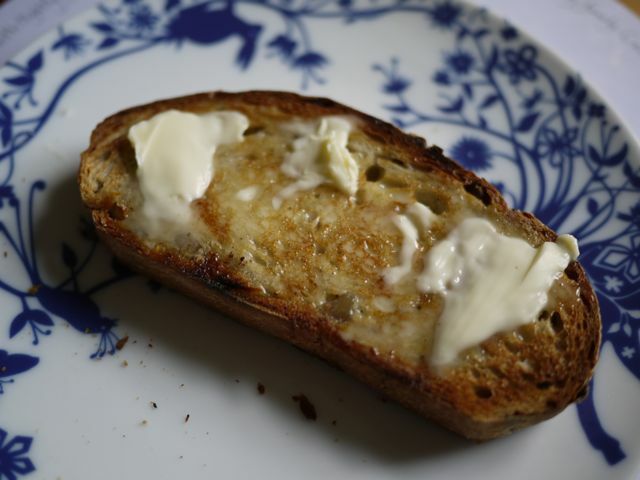 this is so delicious, I had some at the Fire & Knives picnic – best bread I’ve had for a long long time. Linda, if ever you want a new career, I think the bakery trade is the place for you! Do you have any advice on chestnut replacements? I’m often put off by recipes (and, to be honest, entire cookbooks) because I have severe allergies to nuts and I’m often unsure how recipes will work without those ingredients. I tend to shy away from interesting bread altogether just because you never know when they’ll have nuts in them, but I’d love to know if there are nut-free alternatives to things like chestnuts in bread. Hi Mary….nut allergey is not good but there are lots of great bread recipes you could try. This one doesn’t taste especially of the chestnuts so if you are after the softness the chestnuts give then either adding some normal plain flour will do that as will using partly milk mixed with the water. Take a look at the tin loaf I did here http://withknifeandfork.com/fresh-from-the-oven-white-tin-loaf which is yum and adaptable. I’ll try to blog some tasty ones without nuts. I just happen to love chestnuts sorry ! Thanks for the advice – and don’t be sorry! I’m more jealous than anything else, and have spent so long being slightly scared of nuts that I’m still very nervous of them. Wasn’t even 100% sure that chestnuts would give softness rather than anything else – which is why I’m on the hunt for good replacements. I’ll check out your tin loaf too. have you managed any more in the experiment or have you just been worked off your feet? Yes but oops I haven’t blogged them. Must catch up. Progress has slowed though on bread baking. Nice bread means you eat tons of it ! !